The Africa Growth and Opportunities Act (AGOA) is a free trade program involving the nations of Africa and the United States. It was written by Congressman Crane of Illinois (Republican) and Congressman McDermott of Washington (Democrat). President William Clinton sat on it for awhile, but President George W. Bush enacted the program. Under the provisions of the agreement products made from the United States and Africa can be traded with one another with tariff free activity (free trade). The savings can be immense and mutually beneficial to all nations involved. It didn’t take long for China, with its wicked ways, to figure out how it could exploit the program. Eventually China would actually “hijack” AGOA. We saw a shining example of what was going on right before our eyes. We took a trade mission to Kenya. When we arrived at our hotel in Nairobi, we were surprisingly met by the Kenya Cotton Growers Association. They were frustrated and asked for our assistance. Their own nation was refusing to help them trade their cotton crops with the United States under AGOA. We were shocked and confronted this matter with the Kenya Minister of Trade the next day. He went into denial and started giving lame excuses. Members of the Kenya Chamber of Commerce knew what was going on and took us to a new textile factory. The place was massive and very impressive. It didn’t take us long to realize that all the managers were Asian. They were making childrens’ clothing for shipment to Target, Walmart and J.C. Penney’s. The machinery was high tech and brand new. They were producing in mass quantities. Quite conspicuous were the stacks of cotton bails stacked up to the ceiling. Each bail had a stamp that read “Product of China”. That was the “smoking gun”. This was a Chinese operation running Chinese raw materials through this building in Kenya and shipping it to the United States as if the whole operation was African not Chinese. It was a big front at the expense of Kenyan cotton farmers. We would soon realize that the laborers were being paid Kenya minimum wage which is $1.50 per day. The Chinese owners were making massive profits running their products through this plant and shipping to the United States duty free. I sarcastically asked the tour guide, “Who owns this operation – Kenya President Kibaki?” He replied, “Actually it is in his sister’s name”. It would not take long before we discovered such AGOA fronting was rampant throughout the continent. Such elaborate schemes devised so that billions of productscan be shipped duty free to the United States. Meanwhile, our Congress thinks the program is African operated. Soon China lobbyists would convince a few members of the Congressional Black Congress to assist in the charades. We started seeing exceptions to the program popping up here and there and in various nations throughout the continent. They would even declare the island nation of Mauritius to be African territory even though it is over a thousand miles away in the Indian Ocean. Thus, China would start running products through Mauritius and get credit through AGOA. It has even spread to other free trade programs like CAFTA – the Central American Free Trade Agreement. A member of the CBC lobbied for Haiti to be a part of CAFTA even though it wasn’t in Central America. A big sham was exposed when the great earthquake hit Haiti. There was a huge textile factory (like in Kenya) that was destroyed. The whole world was amazed how China came to the rescue. It chartered 747 cargo tankers to bring in new equipment and contractors/engineers to replace the facility within 3 days! It was fascinating. As it turns out it was a very profitable operation. This factory in little Haiti was taking China cotton, silk, etc. and producing fine men’s apparel for Joseph Banks stores throughout America. Of course, it was coming in duty free. If you have a Joseph Banks suit look at the inside label. It may say “Product of Haiti”. We have one! Haiti is still poor while China is getting “fat”. So, when President Trump complains about the Trade Imbalance with China, it is worse than he thinks. If the African Diaspora is to become truly great, we must get China out of our “pockets”. Let us support his efforts in making this a reality. 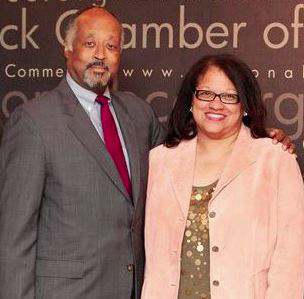 Mr. Alford is the Co-Founder, President/CEO of the National Black Chamber of Commerce®. Ms. DeBow is the Co-Founder, Executive Vice President of the NBCC. Previous articleIs So-Called Eco-Friendly Dry Cleaning Even a Reality at this Point?